Microwave Cooking - Basic Guide and How to! Do you feel that you don't have time to cook? Do you like using technology in cooking? Are you a health freak? If yes, this is what you are looking for. Microwave Cooking - The wonder of technology making life in the kitchen easy, healthy and beautiful! As everyone, even I love cooking with a microwave not only because it is easy, but because I have bought one recently. Not every one knows how to use a microwave. I have an aunt who got a microwave as a gift which she uses only to roast 'Papads'. But it is not designed only for that. Microwave is a gift to cooking. Even I am not an expert when it comes to Microwave Cooking. After some researching, I came up with this mini guide which may come handy and will be useful. -Healthy, as the nutrients are preserved. -Quick, hurray! we have more time. Not all food can be prepared using Microwave. Only few Microwaves well i.e. cooks well. Using food that are not suited for microwaving can not only spoil the recipe, but also damage the microwave oven itself! It is a costly mistake.Take care! -Do not try to hard boil eggs. That is not going to happen with microwave oven. -Do not try to deep fry! This is one of the most important and the most easiest work as far as this appliance is concerned. You can clean in minutes. -Deodorize by keeping the door open for some time and cleaning with baking soda dissolved in warm water. -Another simple way to deodorize (Which I normally do) is by using the below recipe. and you are left with a fresh smelling new microwave. -Plastics that are not marked as oven safe. Now a days we have even cake pans, loaf pans and baking molds suitable for microwaving. Mostly round containers are preferred to rectangle or square shaped containers for microwave cooking. The corners get more microwave energy than the center so round is the best shape to cook evenly. General Microwave cooking - Tips and Techniques that can used to cook any food. - Cover the food while cooking. It helps in cooking evenly and faster. - Wrap bread with absorbing paper to avoid moisture on the top. - Arrange the food so that the center has food that needs less heat to cook and the corners have parts that need more heat to cook. - Pierce the food with toothpick so that it helps in cooking faster. - Stir the food occasionally as directed in the recipe. - Always under cook as food still gets cooked during the standing time. - Be careful while Boiling water, for it can be dangerous sometimes. - Always follow the recipe. Pour 2 cups of boiling water in a microwave safe bowl. Add 2 tomatoes and heat on high for 45 - 60 sec till the skin splits. Cool them and peel the tomatoes with ease. Place 2 -3 cloves on oven floor and heat on high for 15-30 sec. Remove and peel with ease. Pre soak the beans as usual and cook them in a large container, giving space for them to expand. Place them in a bowl with little water, they get cooked with the help of the steam. If you use closed bowls, it gets cooked fast. We generally go with the same recipe for our favorite food and cooking with microwave needs some modification for the taste to come out right. needs 1 cup of water, for microwave cooking, use 1/2 to 3/4 cup of water. - Reduce the cooking time by at least half. 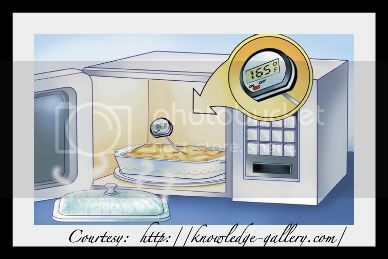 Here is a complete guide of how microwave works and cooks food. Do Not forget to go through the manual before using the microwave oven. This is just the basics. There are a lot more to learn for mastering the art of microwave cooking, which , I strongly feel, comes only with practice. So why wait? Buy a microwave oven, cook and enjoy!!! Do you have a tip to share? What is stopping you? Share it with us! appreciate your comments. Hi Sangeeth. Thanks for you wishes on Moms b'day. Microwave is a real life saver, for a quick bite, after a loooong day! Good post! Thanks for the wonderful information about MW Sangeeth! this is really so useful.